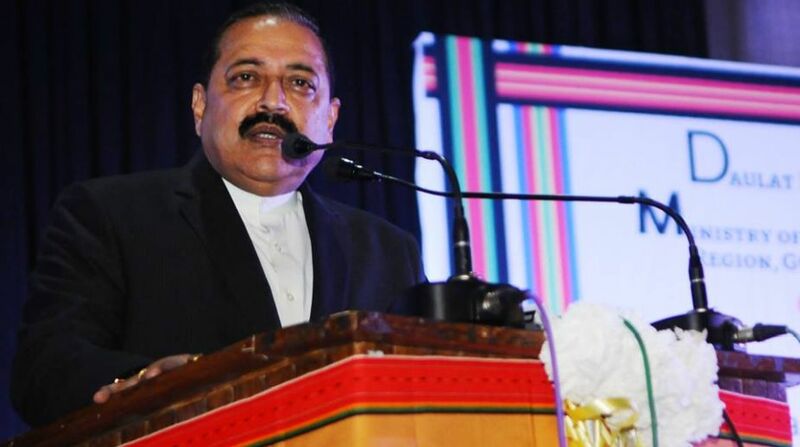 There is need to “change the discourse” around Jammu and Kashmir as there is no such thing as the Kashmir issue, Union minister Jitendra Singh has said, stressing that the only “point of debate” is retrieving Pakistan occupied Kashmir (PoK). The minister of state in the Prime Minister’s Office said this after paying a pictorial homage to martyrs of Jammu and Kashmir Police and slain Army officer Lt Ummer Fayyaz here yesterday. Lt Fayyaz’s Facebook page, letters during his Army training days as well as the photographs of slain J-K officers Mohammed Ayoub Pandith, Feroz Ahmed Dar and others were on display at the event. “There is need to change the discourse (on Jammu and Kashmir) for future generations. We have to change the agenda.There is no such issue as Kashmir issue. It is as much a part of India as Uttar Pradesh, Bihar or any other state. “The only issue if at all is how to retrieve a part of Kashmir which is under the illegal occupation of Pakistan for the past 70 years and restore the Valley in the same format as was handed over by Maharaja Hari Singh,” Singh said. He underlined the central government’s “proactive” steps in bringing development to the Valley, especially with respect to neutralising extremist forces. “The border dwellers, in spite of the hardships they face, have asked us to take strong action against cross-border shelling. We have given our forces confidence and freedom to act on the borders, and the results are for everyone to see. “We have been able to neutralise many terrorists and foil infiltration bids. Our crackdown on terror funding in the Valley is another step to step towards restoring normalcy in the state,” he said. Hitting out at the past political regimes for “mishandling Kashmir”, Jammu and Kashmir Deputy Chief Minister Nirmal Singh, who was also present on the occasion, said the Modi government was the only “ray of hope” for the people. “In a first, the Centre and the state government are on the same page with regard to dealing with terrorism and separatism,” he said. On questions being raised against the PDP-BJP coalition in the state, the Deputy CM said such an alliance was a “bold decision”. “We had to leave a lot of issues dear to us for the larger interest of the state,” he said. Union minister Jitendra Singh said the foreign outreach by Prime Minister Narendra Modi was one of the major achievements of the current dispensation at the Centre. “Many nations that were earlier not convinced with India’s position on Kashmir have come around. It gives the country a major boost in putting forth its stand on the matter on a global platform,” he said. Talking about the return of Kashmiri Pandits to the Valley, the MoS said it was imperative to “create a conducive atmosphere so that the community members returns voluntarily”. Former MP Tarun Vijay, who was also present at the event, saluted the sacrifice of civilians, policemen and army personnel who laid down their lives while battling terrorist forces. Lt Fayaz, an Army officer of Rajputana Rifles, was abducted and killed by militants in south Kashmir’s Shopian district on May 9 this year. Srinagar DySP Mohammed Ayub Pandith was lynched to death outside Jamia Masjid in Nowhatta on June 22 while Sub inspector Feroz Ahmed Dar was killed by LeT terrorists in Anantnag on June 16.